Do you have a tight neck, shoulders or lower back pain that is stopping you from enjoying life? Are headaches, stress and anxiety keeping you from thinking clearly? Would you like some relief from your tired, aching legs? Are you feeling drained and unable to sleep well at night? Hi I’m Carole an aromatherapist and massage therapist who uses massage and essential oils to restore you to your true self. I work with women who feel stressed, anxious, have lower back, neck and /or shoulder pain to regain their vitality. I also assist pregnant women to feel better during their pregnancy. With the exception of Indian Head Massage, essential oils are used in all my treatments. 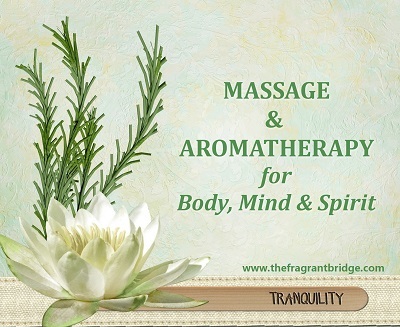 You may choose to have an Aromatherapy Massage, a Spiritual Essence Aromatherapy Massage, an Indian Head Massage, a Pregnancy Massage or a Head and Toes which gives you the feeling of a full body massage without the need to undress. Each treatment is tailored to your needs. The Fragrant Bridge is located in Padstow a few minutes drive from the main shopping centre. To book ring 0404988565 or email for an appointment.